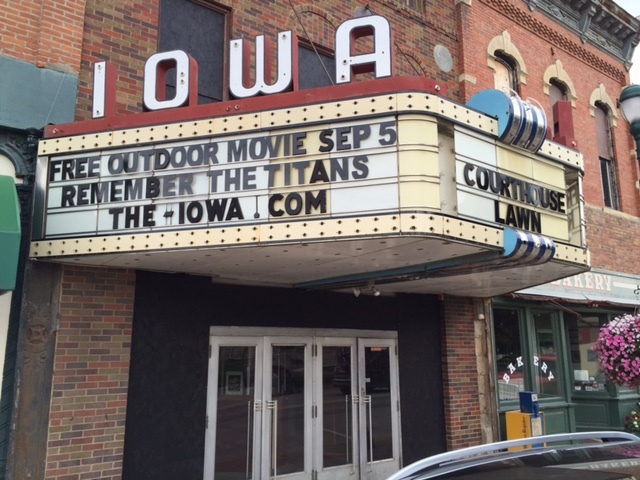 The annual RVTV Road Trip, WHO-tv’s week-long televised street party leading up to the big Iowa/Iowa State game on September 10th, is launching the party on the Winterset Courthouse Square on September 5th. Isn’t that Labor Day, you ask? Why yes, it is! But that didn’t stop us the last time RVTV kicked off the party in Winterset, on Labor Day in 2010. We made quite an impression on WHO Sports Director Keith Murphy, who wrote: “First stop of the RVTV Road Trip, and Winterset put pressure on the other towns. These nice folks did it up right. The RVTV Cy-Hawk street party brought out far more people than we expected on Labor Day. They sold nearly 400 sandwiches before running out before the 6 p.m. news even started.” (See 2010 article here.) Let’s bring that spirit again and help them fire up the fans! And just like last time, you should bring your appetite. In addition to the events above, local RVTV party organizers — Jerry Parkin, Sam Anker, Megan Barrett, Stephanie Gerleman, Erin Walsh, Jennifer Hannon, Dean Botting and Heather Riley — have lined up a FEAST. Fareway will be giving away FREE steak sandwiches, and Hy-Vee and Rodells will provide additional food concessions. 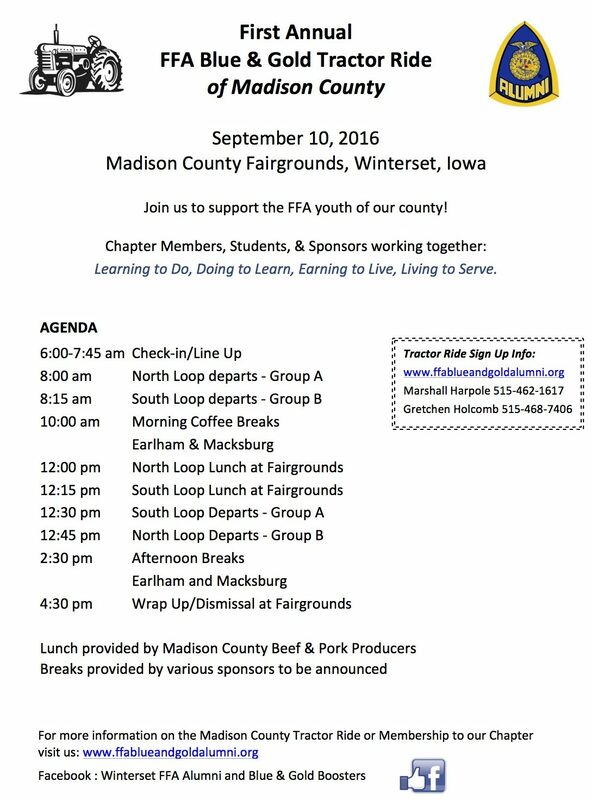 The Madison County Leadership Institute will be providing homemade ice cream, the local boy scout troop will have popcorn tins, the Winterset Band Boosters will have root beer floats, the Chamber will have a lemonade stand, and Farmers & Merchants State Bank will give away free popcorn during the outdoor movie. 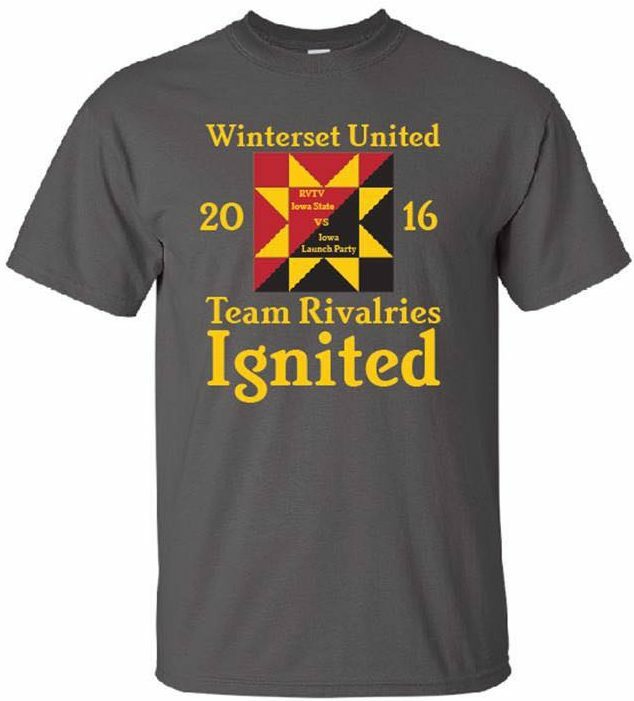 All you have to do is show up, have fun, eat as much as you can, and show them Winterset’s got spirit! 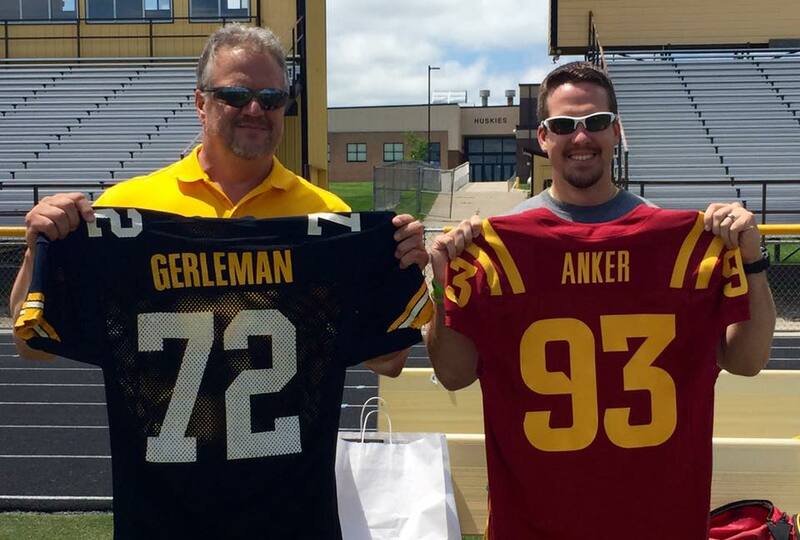 Former Hawkeye Loren Gerleman and former Cyclone Sam Anker want YOU to attend the RV TV launch party on Monday, September 5th from 3:30-10:00. T-shirts wil be available in advance and during the event for $10. After Winterset, RVTV will move on to Mt. Ayr on Sept. 6, Chariton on Sept. 7, Albia on Sept. 8, Bondurant on Sept. 9, and finally the big game in Iowa City on Saturday, September 10, with kickoff set for 6:30 pm. 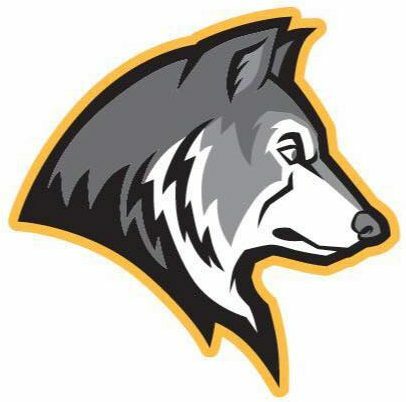 Friday, the 19th, is Meet the Huskies Night at McGaffin Field starting at 5:00. The Quarterback Club’s concession stand will be open and will be serving steak sandwiches. The Booster Club will have their cart open and ready to accept memberships and sell Huskies apparel. Introduction of teams begins at 6:00. The last day of the regular season at the Winterset Aquatic Center will be Friday, the 19th, and later that evening is the annual “Doggie Dip” event. Small dogs (30 lbs and under) can take a splash in the Winterset pool from 6:30 to 7:15 pm, and large dogs (31 lbs and over) can swim from 7:30 to 8:15 pm. The Winterset Parks & Recreation Department also reminds you that flag football registration ends this Friday, August 19 at midnight. Get your 2nd, 3rd or 4th grader registered by going to activity reg.com. 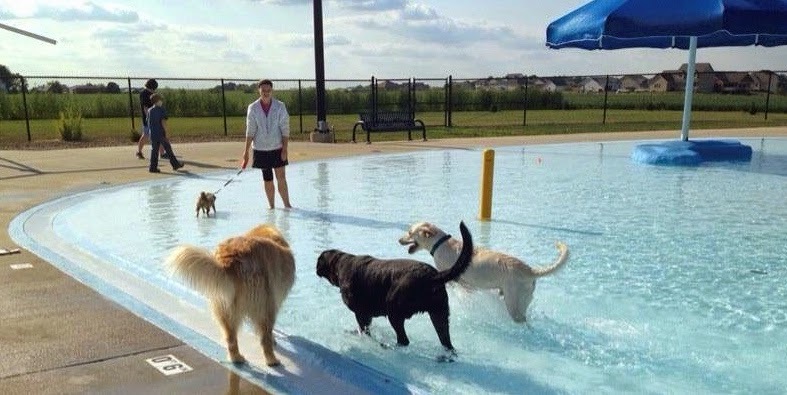 Don’t miss the 2016 Doggie Dip at the Winterset Aquatic Center! The farmers market on the square from 8:00 to noon on Saturday in Winterset will feature sweetcorn, tomatoes, and more. 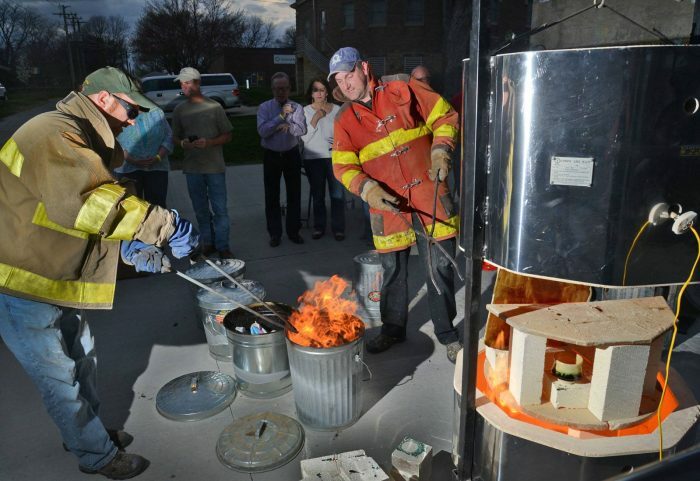 Madhaus Gallery’s next raku firing is scheduled for Saturday, August 20th starting at 10:00 am. Reserve your spot today by calling Robin at 515.707.4309. Their friendly potters from Minnesota, Chad Jerzak and Mark Lusardi, are coming down to lead the event. Don’t miss this wonderful opportunity to ‘make and take’ a beautiful handmade piece of pottery. Re:home is open through Saturday this weekend. 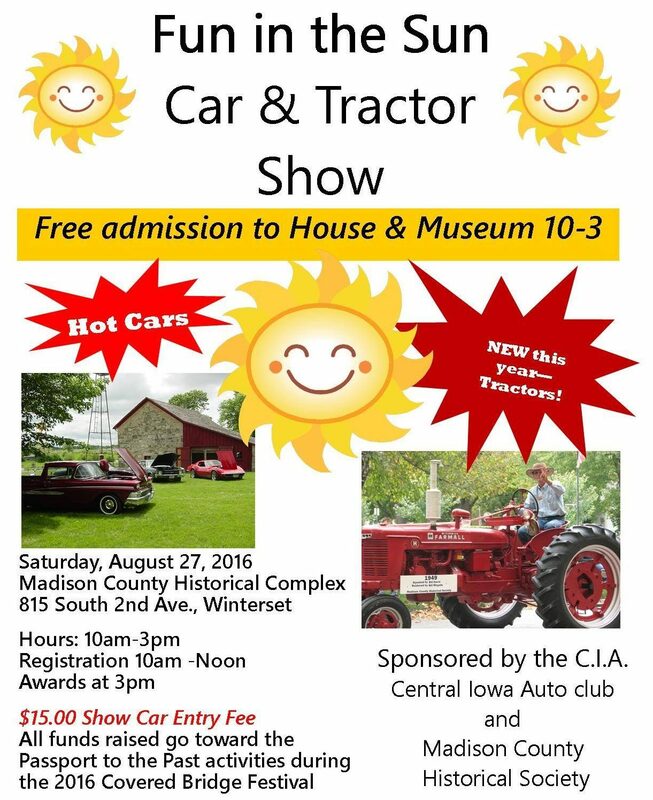 Next weekend — Fun in the Sun at the Madison County Historical Complex! Also next weekend: Winterset Girl Scout Troop 647 has contributed time this summer to volunteering and cleaning up at Middle River Park. To celebrate, they are hosting an Ice Cream Social at the Middle River Park. 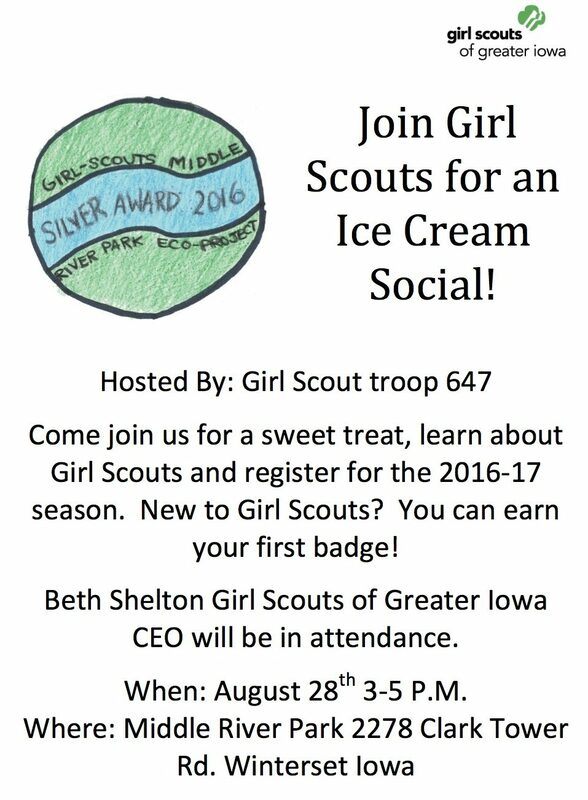 The CEO of Girl Scouts, Beth Shelton, is coming to this free event. Please come to see the work they have done this summer and enjoy a sweet treat on August 28th from 3:00 to 5:00 pm. Do you have a family member with mental illness? Have you struggled to understand the diagnosis? Would you like to know how to take care of yourself while caring for your loved one? Beginning Thursday, September 1, 2016, the NAMI Family-to-Family Education Program will begin a free 12-week course for families and friends of individuals who are dealing with mental health conditions such as ADHD, Bipolar Disorder, and Schizophrenia. The course is taught by trained family members who have lived with this experience. It teaches the knowledge and skills that family members need to cope more effectively. 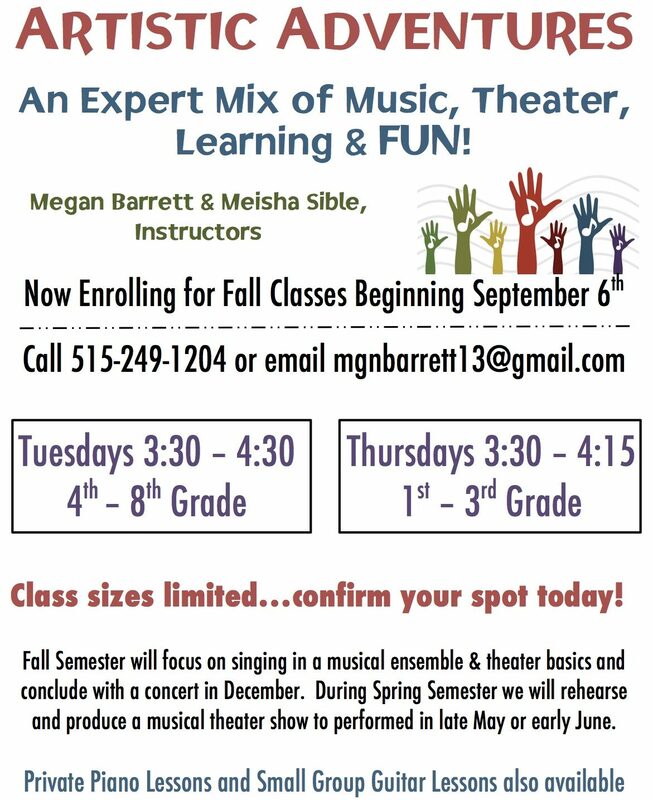 Classes will be held at the Crossroads Mental Health Center at 102 W. Summit in Winterset. 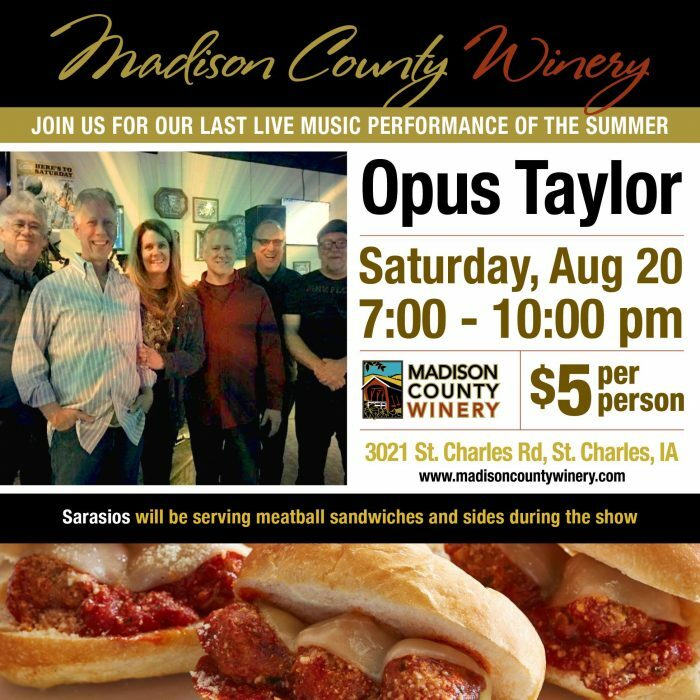 To register, or for more information, contact Pat Nelson at 515-468-0775 (or pknelson19@q.com). 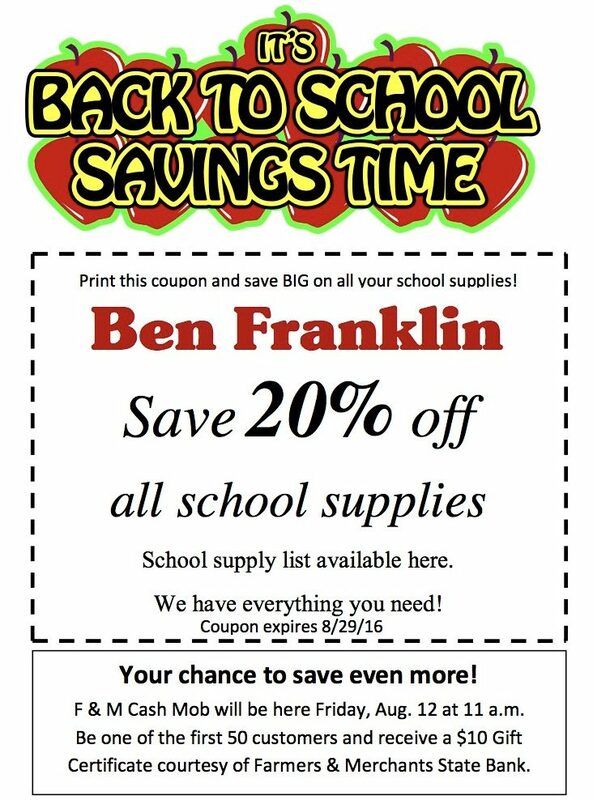 Click here to download a flyer with more information as well. And here’s an opportunity to support the youth of our county, coming soon! Click here for a registration form (register by August 30th) or here to become a sponsor of the First Annual FFA Blue & Gold Tractor Ride of Madison County. 70 degree temperatures yielded 3 overall records at the 17th Annual CannonBall Pump and Run hosted by the Winterset Rotary Club on Saturday, August 6th at Monumental Park. 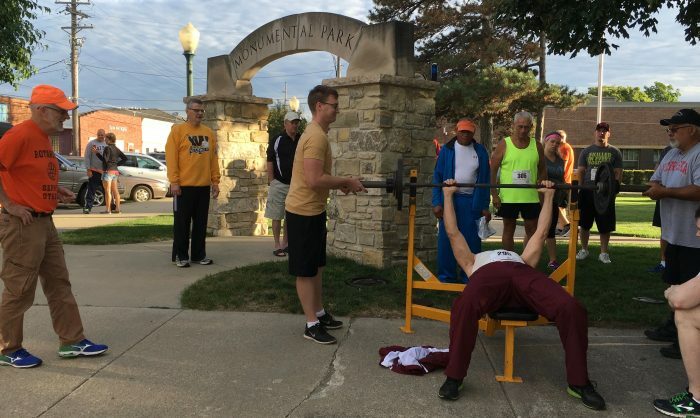 The event is a test of endurance and strength as participants attempt to bench press their body weight or a percent of it. For each bench press completed, 15 seconds is subtracted from their 5K or one mile time which is run after the bench press. The fastest adjusted time is the winner of the event. This year Able Mahaffey, Altoona, 35-39 age group won the 5K event by benching 180 lbs 20 time then finishing the 5K in 20:55 for an adjusted time of 15:55. The overall record since 2000 for the event was set in 2012 by Rocky Hardy W.D.M. at 7:33. Second place was claimed by Mark Hayes, Creston, 65-69, who lifted 110 lbs 27 time, ran a 24:07 5K resulting in a 17:22 finish. Third place was Pella’s Dave Wisniewski who pumped 155 lbs 32 times, ran a 25:59 5K for a finish time of 17:59. Heather Iburg, St Charles, was the strongest and fastest woman to finish. She competed 19 presses at 85 lbs. ran a 20:56 5K, with and adjusted time of 16:11. Second place went to Rachael Olson, Bondurant, 25-29, who ran an 24:35 5K, pumped 80 lbs 30 times for and adjusted time of 17:05. Third was Rayeann Archibald, Altoona, who pressed 85 lbs 25 times, completed a 25:02 5K, giving an adjusted time of 18:47. In the One Mile Pump and Run Kruse Kiburz, Winterset, was first and set the new record for the High School division. Kruse pumped 130 lbs. 15 times and ran a 5:50 mile for a new record of 2:05. In the 5K race Blake Ryerson, Winterset High School, ran the fastest 5K of the day in 19:35. Dawn Hayes, Waukee, won the women’s 5K and set a new age group record for 45-49, in 24:25. Abram Wadle won the One Mile Run in 8:05. The Winterset Rotary Club thanks all the many sponsors and volunteers of this race and the other two races they sponsor. The proceeds of these events go back into the community in the form of support for scholarships, maze projects, dictionaries, skate park, birthday-in-a-bag project, student exchange programs, and many more local activities. The next race is scheduled for Oct 8th, Covered Bridge Days. A 4K and 8K will be run at the City Park. 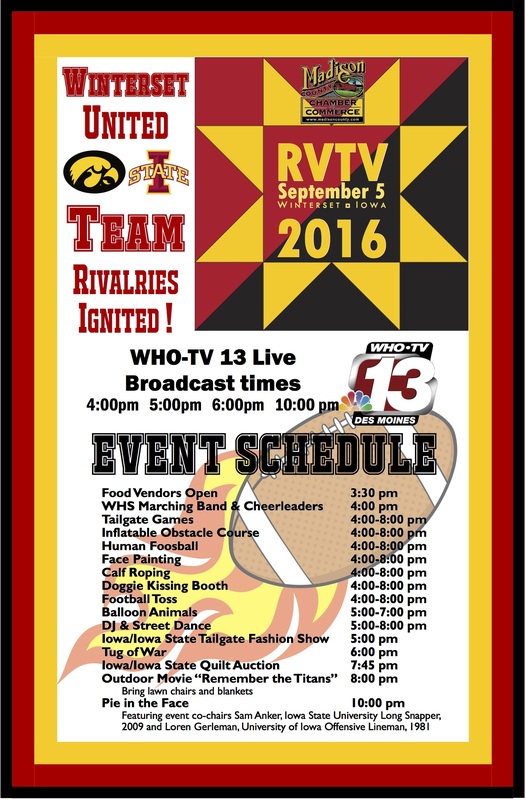 See you at the RVTV party on September 5. Go Hawks!